I thought I’d review this cute little plant-based cafe/restaurant after enjoying a great value, tasty lunch there when meeting a friend. 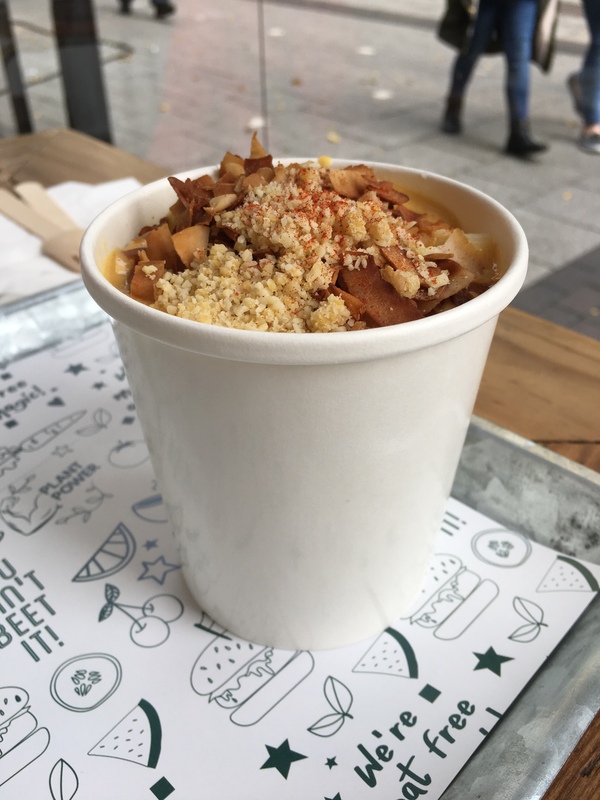 You won’t find Fressh in Oxford, but Birmingham is just a direct train ride away and I’m sure many of the people reading this blog will go or have been on a day trip there at some point, and I enjoyed my meal there enough that I wanted to share it with you! Fressh has a fast food set up but they still offered us table service, so we took a seat while they prepared our meals. We arrived at 11.30am already super hungry for an early lunch, so perhaps during the rush they might not serve you your food right to your table, but it’s a pretty small place so I think that’d be fine. 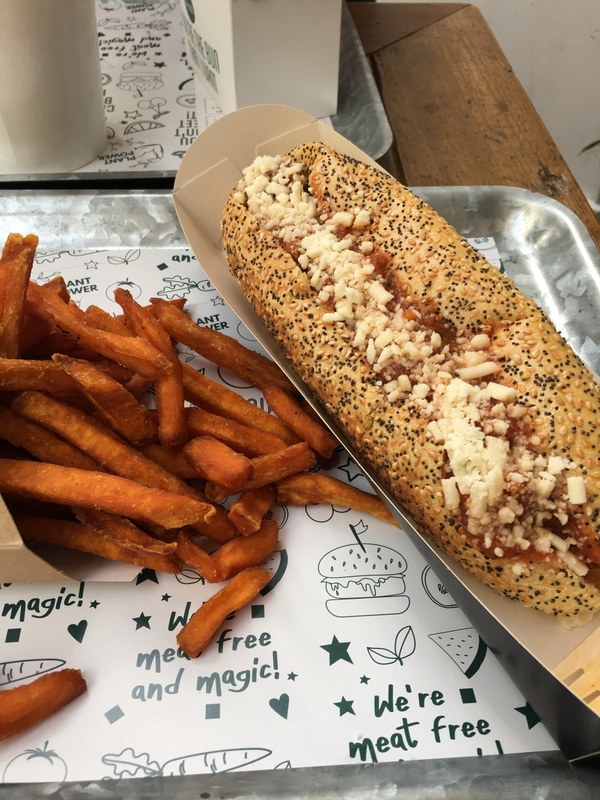 I ordered the meatball sub and added a side of sweet potato fries for £2 extra. The sub is a really decent size, with four or five veggie meatballs in a long seeded soft bun. Forget opting for a soggy plain salad Subway. The tomato sauce had some spice to it and the whole thing went down so well – though admittedly the meatballs were large enough that it was a bit of a challenge to eat without getting at least some sauce round your mouth. The sweet potato fries were really nice, though I discovered best eaten warm as we took a while over our meal and the last ones in the box were a bit sad. I could’ve done with a tiny bit more salt on them, but they were perfectly cooked with a crispy outside and soft middle. My friend ordered the What The Guac burger and she definitely enjoyed her meal too. 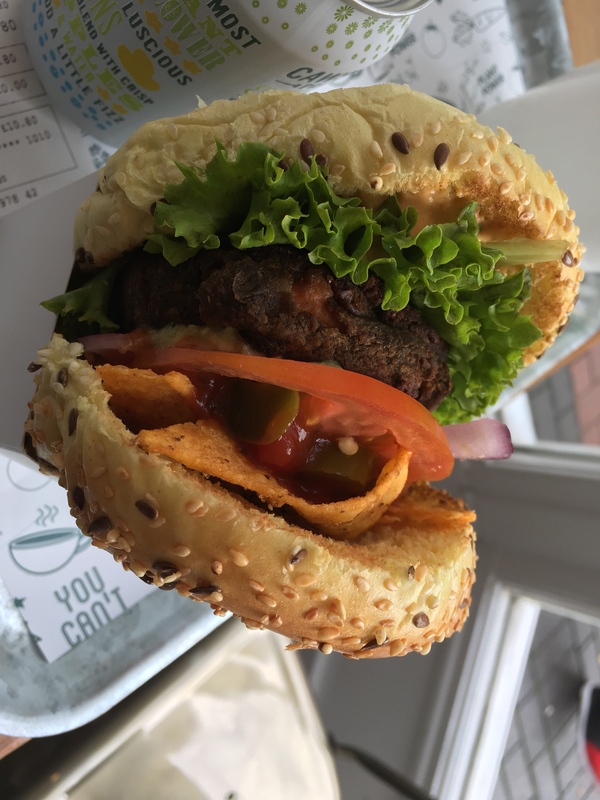 It looked loaded with fresh fillings and she said the mixture of the different sauces – the guac, salsa, and burger style ‘Fressh sauce’, prevented the burger from being a bit dry, and it was packed with flavour. The jalapenos gave it a spicy kick too. We’d also ordered a pot of mac n’ cheese to share between us. The sauce was made with butternut squash and almonds, and it was topped with a generous handful of coconut bacon and almond parmesan. The sauce was so smooth and creamy, and as usual for a vegan ‘cheese’ sauce it wasn’t super cheesy but it totally had those American style mac n’ cheese vibes and it was probably the best vegan version I’ve tried. The coconut on top was salty, smokey, and gave it a needed bit of crunch. Would definitely order this again next time, and probably go for a whole bowl to myself! 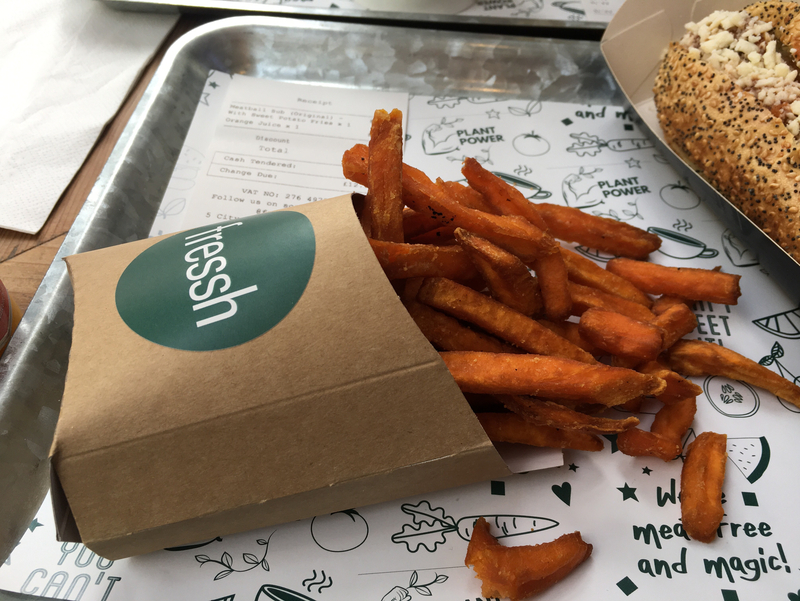 Fressh is just a five minute walk from the platform at Birmingham New Street station and I definitely recommend stopping by if you’re in town. I thought it was great value, and actually offered vegan fast food at a similar price point to what you might find at somewhere like Burger King (something I feel Oxford is lacking I have to admit). The quality of the food however is way better than that! They offered a 10% student discount, and while we enjoyed a leisurely lunch over a good hour and a half there, it would also be perfect for grabbing on the go – and you could get a further discount on many items if that’s what you did. The food was super filling but I only wish I had room to try one of the cookie sandwiches, pretty looking cake slices, or a brownie on my way out. As an added testimony, my friend is not even a veggie, but she has mentioned multiple times since our visit how she would like to go back soon. Perhaps I can ask her to check out those dessert options!